Amidst a pile of books, USB cables, pens and cotton buds, you'll find these products scattered somewhere on my bedside table as I like to use them before heading off to the land of nod. Burt's Bees Beeswax Lip Balm (4.25g, £3.69, link) - this is their original peppermint flavoured formula and I've gone through so many tubes of these over the years. 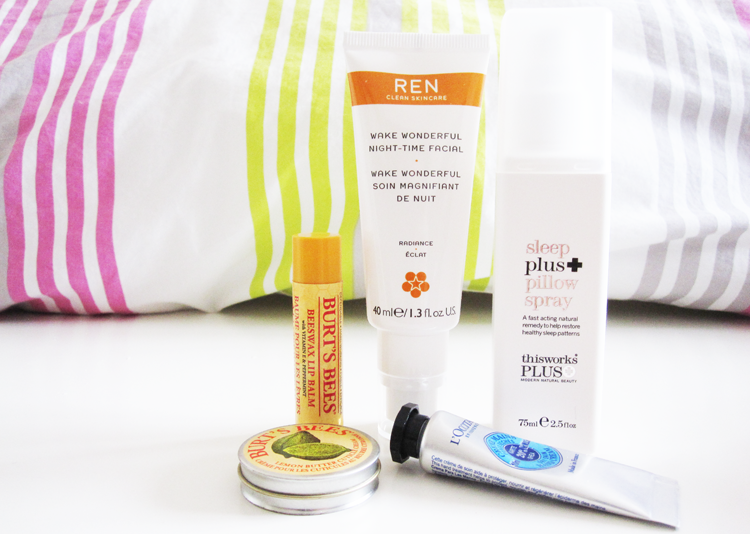 Really hydrating so perfect for keeping chapped lips at bay. Burt's Bees Lemon Butter Cuticle Cream (15g, £6.89, link) - surprisingly this was the first product that I ever tried from Burt's Bees and I've been using it on and off for years. It's a thick butter that smells like lemons and does an excellent job of hydrating dry cuticles. A little goes a long way with it! L'Occitane Shea Butter Hand Cream (30ml, £8, link) - one of my holy grail hand creams and one of those products that is loved by many. Quite simply it's amazing because it's thick and buttery, but completely non-greasy or sticky. I don't know how they do it, but I always have the softest hands after using this. 100% worth the hype. I have mentioned numerous times that I have problems with sleeping - I'm one of those people that just struggles to switch off when I need to, so I appreciate any helping hand when it comes to getting my eight hours in. I've dabbled with various products and do switch them up every now and then, but the one that I've consistently found the most effective is This Works Sleep Plus Pillow Spray* (75ml, £25, link). I've used the regular Sleep Spray in the past with good results and their new 'Sleep Plus' version is like an upgraded model with an even more potent blend of natural plant oils; Lavender, Vetivert and Patchouli being the main core. To use, I just shake the bottle and spritz over my pillows and bedsheets. You don't need many sprays as it's a very concentrated mix, and it really helps me to relax, and thus, sleep much better than when I don't use it. If I'm keeping my evening skincare routine simple that night, I'll sometimes apply a little of REN Wake Wonderful Night-Time Facial* (40ml, £32, link) to give my skin a cheeky overnight boost. As the name may suggest, this is a leave-on treatment and you can use it either on its own as I often do, or over serum and under moisturiser in your skincare routine. It's main three purposes are to exfoliate (using fruit acids and enzymes, so not manually), revitalise and plump up the skin whilst you sleep - and it absolutely does all three of these. It uses lots of natural actives such as Lactic and Glycolic Acid, Magnesium, Cranberry Seed Oil and Artic Blackcurrant Seed Oil to achieve these aims and my skin looks noticeably more refreshed and brighter in the morning. It's like a light cream in texture, absorbs quickly and doesn't feel sticky. If you're a fan of REN's Glycolactic Radiance Renewal Mask (reviewed here) like I am, you'll love this. I've been struggling to sleep recently and found a little sample of the This Works Pillow Spray which definitely helped me out, although I did go slightly overboard and end up dowsing my pillow in it! Might have to try the pillow spray! I've been lusting that pillow spray for ages, not sure what's keeping me from getting it! It's worth trying for sure!